Today, after lunch, Richard and I walked over to the Ohio Statehouse to check out the big union rally against Senate Bill 5, the bill that would affect the ability of public employees to engage in collective bargaining rights. I had been hearing the hubbub outside my office window and was eager to see the turnout. We got to the Statehouse about 12:45 and entered at the Third Street entrance. There were some union folks out on Third Street and milling around the entrance. We saw people wearing public employee union t-shirts, jackets and buttons in the map room and in the Atrium above. Rows of chairs had been set up in the Atrium, facing each other across a center aisle, and as we walked through a large, leather-lunged woman was leading the crowd in “We want respect” chants. I would estimate that several hundred people were in the Atrium, and they were in good spirits. We crossed through the Statehouse Rotunda and exited out the Broad Street entrance, which was where the real action was. A temporary stage had been erected and two singers with guitars were singing union songs. The crowd covered about two-thirds of the west lawn and sidewalk, with people sitting on the benches and standing on parts of the McKinley memorial. There were lots of union t-shirts, hats, and some very creative signs criticizing Governor Kasich. Some of the signs seemed to be generated by outside forces. For example, we saw several signs referring to Governor Kasich and Wisconsin Governor Walker as “Koch-heads” or “Koch addicts,” and I’m not sure most union workers would focus on the Koch brothers as sign material without some kind of prompting. The people at the rally were pleasant and friendly, and the whole gathering had an upbeat open-air feel. The Ohio Highway Patrol had officers at points in the Statehouse, and they were professional and friendly as always. 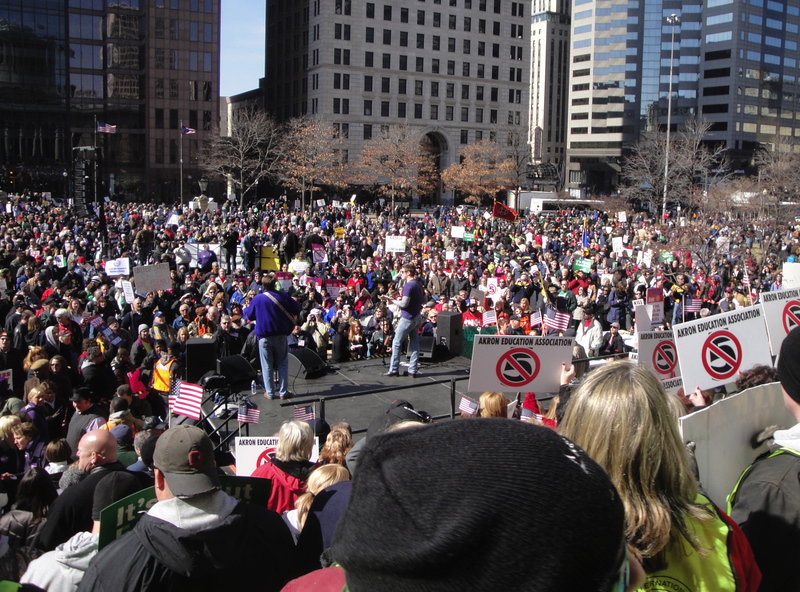 We later heard an estimate that 8,500 people were at the rally. I’m not sure it was that large when we were there, but there definitely were thousands of people in attendance. We did not see any counter-protest. Regardless of your politics, if you are downtown restauranteur you have to like these protests. We saw lots of protestors crowding into the Tip Top, Dunkin Donuts, and other restaurants in the core downtown Columbus area. Frank Buckles died on Sunday, at age 110. Buckles was America’s last surviving World War I veteran. He enlisted at age 16, after lying to a recruiting officer about his age, and served as a clerk and ambulance driver in England and France. The Washington Post reports that, with Buckles’ death, only two of the 65 million people who served in World War I are still living. There is something terribly final about the death of the last human being to personally experience a war. With Buckles’ passing, we lose the last American who was there during the awful carnage of trench warfare, the horrors of poison gas attacks, and the deadly charges across no man’s land into the teeth of barbed wire, machine gun bullets, and fortified bunkers. No more Americans will be personally tormented by nightmares of the deaths of their comrades during The Great War. With the severing of the last human links to the fighting, World War I moves from the realm of personal experience to the exclusive province of historians. They will argue about tactics, and great historical forces, and issues like how the war could have been avoided and whether the German side could have prevailed had it acted differently. Eventually a war in which millions of people participated and millions died, a war which saw the development of new weapons like the airplane and the tank — a war that participants thought was surely The War To End All Wars — will become as abstract, dusty, and inexplicable as the Hundred Years’ War, the War of Jenkins’ Ear, or the War of Austrian Succession. Frank Buckles’ passing takes us one step closer to that reality.